Image: Veliki naravni most, a natural bridge in the Rakov National Park near Postojna in Slovenia. Karst areas, are areas with a special geology, most caves of the world are located in those areas. The thing they have in common is a rock which is soluble in some way by rain water. As a result the water will create lots of caves. Karst has several other geological features beneath caves, which are interesting too. 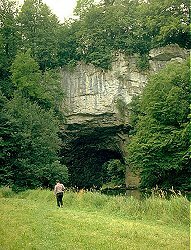 Typical objects of this kind are sinks, swallow holes, springs, Karst lakes, and natural bridges. I tried to add some of them to showcaves.com, because they are not only interesting but sometimes very spectacular. A lot of them are also tourist destinations. It is hard to get information on this kind of sight, so the number of described places is much less than the number of show caves. Nearly all of those objects are protected! Please respect this! Even if they are not protected by the law, please be careful and do not damage anything on your vistit. The Geology of Karst Features. Index of Karst Features described on showcaves.com. Index of Karst Features grouped by country.